Separated only by the Strait of Gibraltar, Spain and Morocco tours venture to two countries worlds apart but intricately woven together through history. While both are incredibly scenic, each has a unique flavour and perspective to present. Journey from Madrid to Casablanca to taste, smell, and experience the rich culture of both countries. When the Moors invaded the Iberian peninsula in 711 AD, their presence would leave a lasting impression on the Spanish countryside until present day. In their wake they left a myriad of architectural wonders. 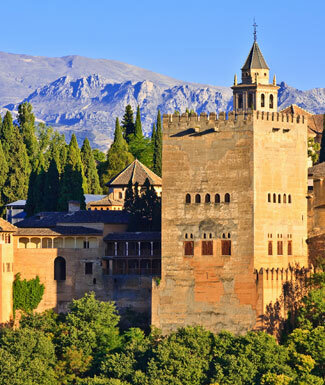 Our Spain and Morocco tours visit their masterpiece of the Alhambra in Granada, a palace complex set amongst the backdrop of the stunning Sierra Nevada mountains, the highest mountains of Spain. We will wander the cobblestone alleyways of this medieval city, spy the Islamic decor and landscaped gardens found within this 13th century fortress with extraordinarily ornate 'lace in stone' details found within the palace. Without a doubt, this monument is without rival in Europe. Beyond the Alhambra are many more impressive Moorish sites. In Cordoba, Spain and Morocco tours visit the Great Mosque of Cordoba, one of the oldest structures still standing which was built by the descendants of the exiled Umayyads. The Alcazar Palace in Sevilla, is a 14th century palace set in the picture-perfect image of Andalucia, complete with orange groves and flower-filled patios. It was here where King Ferdinand II and Queen Isabella once resided and finally conquered the Moors, freeing their lands from 700 years of Moorish rule. The Catholic Monarchs would go on to create papal decree for the Spanish Empire that would colonize the Americas and claim them for Spain. It is after Sevilla that the Spain and Morocco tours jump the continent, leaving behind Europe and venturing to Africa. From the Strait of Gibraltar the first entrance into Morocco showcases a blend of North Africa, Spain, Portugal and France. But also a country drenched in exotic mystery, interesting history, beautiful vistas, and friendly people. It is by exploring the imperial cities of Morocco (Fez, Meknes, Marrakech and Rabat) that one begins to understand the nuances of this ancient land. Wander the labyrinth of alleys and lanes lined with shops, mosques, homes and schools in the historic cities that were once the capitals. The souks and squares in each town offer a chance to see locals wares such as carpets and pottery, two artistic pursuits for which the Moroccans are known for. The smell of mint tea never seems far away and the cities themselves seem to have changed little over the centuries. Away from the imperial cities, it is the mountainous backbones of the High and Middle Atlas mountains that leave even intrepid travellers in awe. Folded mountains and high, windswept plateaux, vast forests of cork oak and cedar, and lakes and streams full of trout are the qualities that make up this Berber country, with sheep and goat-rearing as the main occupation. Spain and Morocco tours offer the chance to stand on the shifting sands of Merguza, sand dunes reaching heights of more than 45 metres (148 ft) with their colour shifting from pink to gold to red to white depending on the time of day. From Madrid to Casablanca, Spain and Morocco tours are for the curious. For those who love a mix of metropolitan and traditional, historic and artistic, spicy yet sweet. For those looking to find UNESCO world heritage sites and memorable landscapes around every corner. The local guides were outstanding--especially Mattie in Madrid and Elisa in Granada. In Toledo, I loved going to the knife factory. Fes was my favorite city, and I loved going through the medina. Mattie was funny, knowledgeable, and very interesting. I loved the fact that she told us about some of the politics in Spain with the prince and the demonstrations. Her explanation of the paintings in the Prado was outstanding--even worth repeating! Elisa was also very informative and friendly. Khaled in Fes was also outstanding. Laura was very knowledgeable as to history and the culture in each of Spain and Morocco. Her language skills...Spanish, Arabic, French certainly made it easier for us to move about and have issues negotiated. I think she set the right tone of friendlyness; to her clients. She made her self available to help solve medical issues as well as ATM issues. Today we fly back to Casablanca and connect with flights that generally leave late in the evening. NOTE: The flight to Casa is included in your trip cost; if booking your own flights from Casablanca, land only passengers need to take into account the timing of the flight from Ouarzazate before booking their air from Casa. Land transport throughout by private air-conditioned motor coach, 24-36 seats depending on ultimate group size (see 'group size'). Though we will have some full bus days (especially in Morocco) there are plenty of stops of interest. Train journeys are comfortable (2nd class). YOU MUST BE ABLE TO MANAGE YOUR OWN BAGS ON/OFF TRAINS AND IN TRAIN STATIONS. Please also note that, due to the narrow and winding nature of the streets and the size of our vehicle, we may need to park some distance away from our hotels in Granada, Córdoba, and Rhonda and walk our luggage a short distance. This trip involves considerable walking up hills and stairs and on uneven or cobblestone streets. You should be in good physical condition to enjoy the tour to its fullest.